If you're a fan of comfort dressing when it comes to fashion, you'll love this totaly stylish pairing of a light blue oversized sweater and a Gucci double g belt from farfetch.com. Up the cool of your ensemble by finishing off with black suede pumps. If you're all about relaxed dressing when it comes to your personal style, you'll love this totaly stylish pairing of a beige coat and a Gucci double g belt. If you're a fan of relaxed dressing when it comes to fashion, you'll love this chic pairing of a white v-neck sweater and a Gucci double g belt from farfetch.com. If you're a fan of comfort dressing when it comes to fashion, you'll love this cute pairing of a light blue vertical striped dress shirt and a Gucci double g belt. If you're a fan of relaxed dressing when it comes to fashion, you'll love this chic pairing of a black chiffon short sleeve blouse and a Gucci double g belt. We're all getuping for comfort when it comes to dressing up, and this combination of a green fur jacket and a Gucci double g belt is a practical example of that. If you're all about relaxed dressing when it comes to fashion, you'll love this adorable combination of a red turtleneck and a black leather belt. Grab a pair of grey athletic shoes to make the outfit current. If the setting allows casual style, dress in an olive military jacket and a Gucci black leather belt. Give this look a hint of polish by rocking a pair of white canvas low top sneakers. 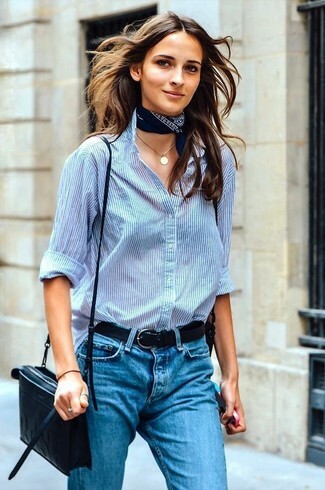 If you're a fan of functionality dressing when it comes to your personal style, you'll love this seriously chic pairing of a white dress shirt and a black leather belt.